I've only just remembered today that I am sitting on a vast hoard of newspaperly gems from The Guardian and Observer, including this small vote of confidence from none other than Vita Sackville-West. Ms. Sackville-West (you may remember) had a bit of a run-in with the poetry committee of the Society of Authors in March, 1946, in the midst of trying to decide who would read at an upcoming poetry recital for the Queen. If she held any ill-will towards Reed she does not show it in her review of A Map of Verona for The Observer on May 5th ("Seething Brain," p. 3), little more than a week before the recital. 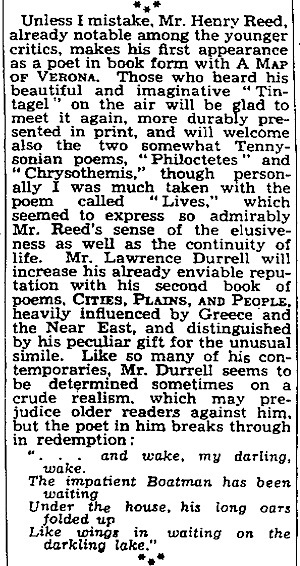 In addition to Reed's A Map of Verona: Poems (Cape) and Durrell's Cities Plains and People (Faber), Sackville-West also reviews (at length): Dylan Thomas's Deaths and Entrances (Dent); Edwin Muir's The Voyage and Other Poems (Faber); Four Quartets Rehearsed by Raymond Preston (Sheed and Ward); Pushkin's Poems, translated by Walter Morison (Allen and Unwin); Modern Czech Poetry translated by Ewald Osers and J.K. Montgomery (Allen and Unwin); and Joseph Braddock's Swanhild (Chaterson). As for Vita and Henry, well... the poetry committee didn't pick him, either. 'Island of Goats,' a recent flop on Broadway, had foreign appeal on both sides of the Atlantic. Having previously clicked in Paris, the show repeated with the foreign press reviewers in N. Y. It drew unanimous pans from the first-string Broadway critics. 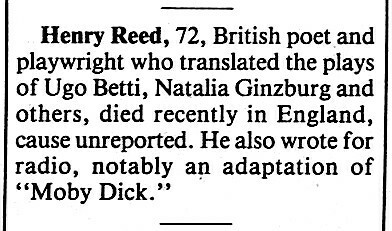 The Ugo Betti drama, adapted by British playwright Henry Reed, folded Oct. 8 at the Fulton Theatre, N. Y., after seven performances. Following the windup performance, Saul Colin, a member of the Stage & Screen Foreign Press Club, took over the stage to praise the play, noting that 80% of the foreign publication aisle-sitters had turned in favorable notices. Colin also shook hands with the entire cast, who had been standing on one foot and then the other. So, the site experienced a horrible breakdown owing to an upgrade to PHP5 on my hosted server. All links were leading to the main page, and for who knows how long? Hilarious. I had to track down all my calls to get variables sent through the URL on all the page templates, and update them to the correct $_GET['$var'] format (or, in an SQL query, '$_GET[$var]'). That's what I get for not using WordPress or another supported service. A few things may still not be working (comments, for instance, and will I be able to post this update? I think all my calls to post are properly formatted $_POST['$var']), but at least you can navigate the site! Update: Aha! I could post, but not edit. Fixed fixed.